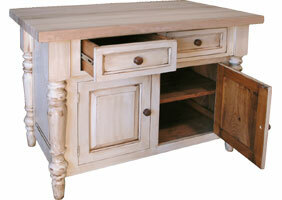 The Butcher Block Kitchen Island with turned legs, two doors, and two drawers. The island has turned legs on the corners, bevel-paneled doors and drawers with wood knobs, and a thick butcher block top. The side and front panels are beveled. The two drawers are on metal glides for ease of opening and closing. There is one shelf behind the two doors and is removable. The butcher block is untreated and requires oiling. Both consummate cooks and casual bakers adore the Butcher Block Kitchen Island. The highly-functional work table aids in the prepping of meals providing a perfect blend of kitchen worksurface, cabinet storage and drawer storage. 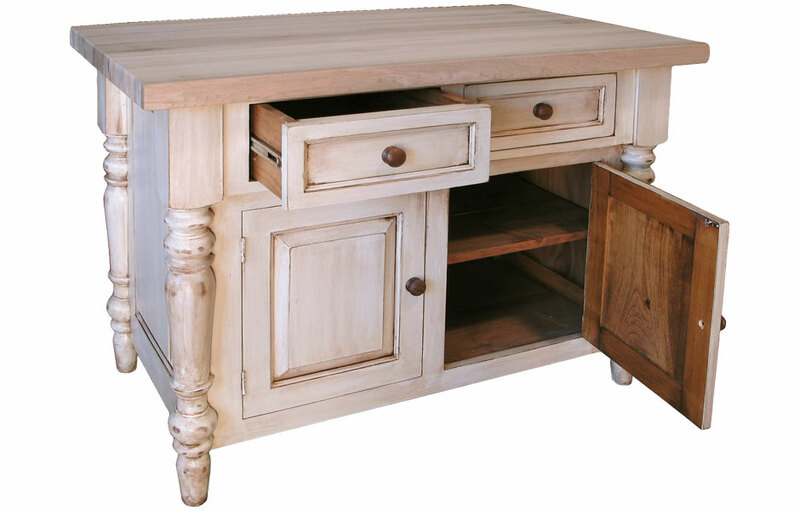 The Butcher Block Kitchen Island work table is built of solid wood. 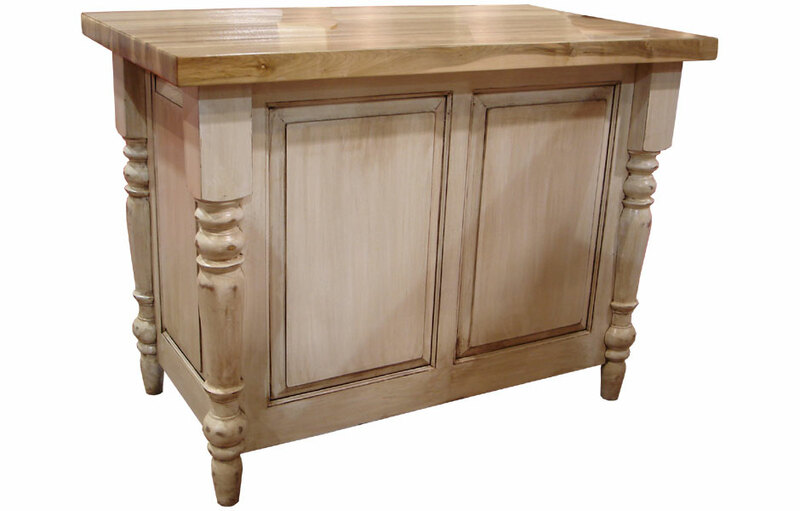 The front and side of the island have elegant raised decorative panels. The 4" hardwood turned legs add sturdy prominance to the corners of the island. The kitchen island features easy-glide drawers on metal glides to store utensils and hand-towels. The durable, closed storage cabinet accommodates large pots and appliances. The 3-inch thick butcher block top is made of solid hardwood, and is left unsealed, giving you the option to oil the top as needed. The Butcher Block Kitchen Island is ideal for small space kitchens looking to enhance counterspace. The butcher block top is intended for daily use, cutting and prepping your favorite meals. 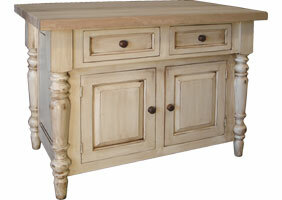 The kitchen island is available in standard length of 48" long x 28" deep (4ft.). The small kitchen island can work well into many kitchen styles. 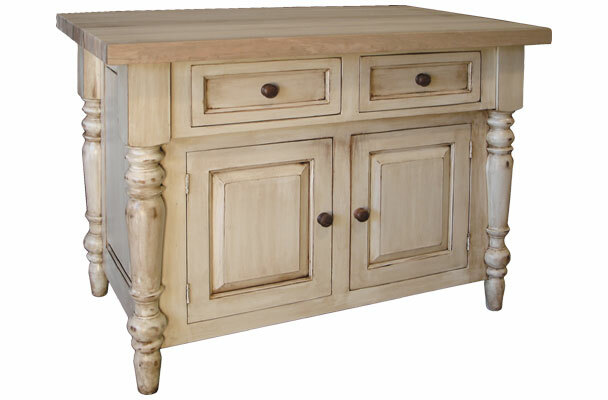 The French country Kitchen Island is standardly painted in a classic two-tone French country finish (raw wood top and painted base). But, can be finished in one all-over stain or paint finish. Butcher Block Kitchen Island, Champlain White.